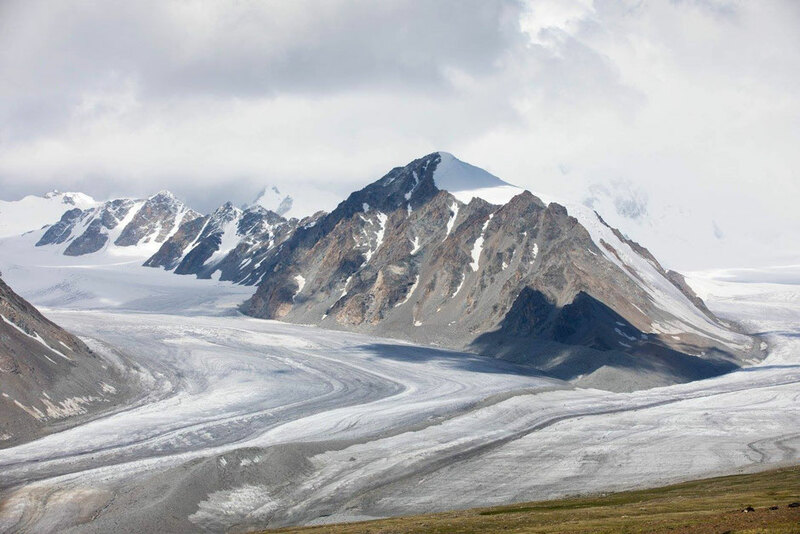 Altai Tavan Bogd Mountains located in Bayan Ulgii Province, it is have become the home of the Tuvan Ethnic group, who spend their summer at the bottom of the peaks. The name of the mountains means Holly Five Peaks, which refers to Mongolia's five highest peaks. The mountain's northern slopes are in Russia's Altai Republic and its western in China's Burqin County. The locals are respecting the nature, and every four years, the Mongolian president comes to the place and pay respect to the mentioned highest peaks. Le us now find out what this Holy Five Peaks everyone is talking about, and we will see what activities are best to do there. This mountain is highly regarded as Mongolia's highest point, with a height measuring 4356 meters from the sea level, and it has its permanent snow cap. Only the professional mountaineers are climbing the peak due to its height and difficulty. Firmly standing which a height of 4180 meters, this mountain is also known as friendship peak because it marks the tripoint between China, Russia, and Mongolia. One of the Mongolia's Altai Mountains highest peaks is the Burged Peak, which means "eagle". The peak is excessively stiff, which make it hard to climb. The mountaineers don't try to climb the peak, and nobody is yet officially declared to successfully climb it, though, in the previous years, the Mongolian mountain guides give themselves a try to climb the mountain's peak. Considered as one of the Holly Five Peaks in Mongolia, mountain that has a height of 4050 meters from the sea level. Malchin Peak is located the borders of Russia and Mongolia, this mountain stands at 4050 meters. Among the Holly Five Peaks, Malchin Peak is the one that anyone can climb without any climbing gear and equipment. However, you need to posses at least basic climbing skills since the mountain is quite stiff and the rocks are slippery. But when you reach the top ans see the entire beauty of Altai Mountains, all your efforts are paid off. Though skiing in the peaks are not so popular, some tourists come to do the skiing adventure during April and May because the snow is thick and the weather is good. Western Mongolia, together with Tavan Bogd National Park has become the land of the gorgeous Altai Mountains, nomadic eagle hunters, and both local and foreign tourist looking for a great adventure.